I try to update to the latest Carbon ROM. The check is successful, but the flash fails with "Failed to setup flash. 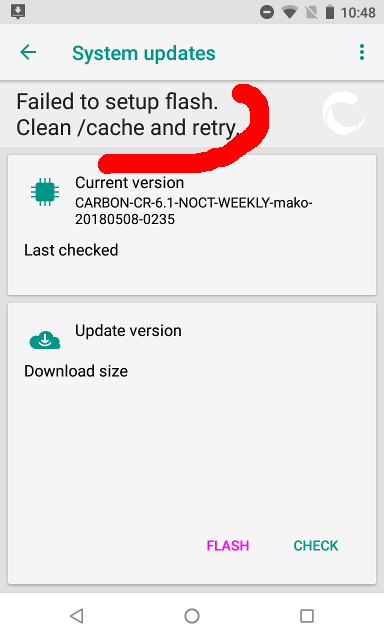 Clean /cache and retry." and tried the update again without success. Happens the first time for me, last update was just recently on 8. May without problems. I also just tried going in Recovery Mode > Team Win Recovery Project > Wipe > Advanced Wipe > select Cache > Wipe. But the problem still remains after the reboot. Browse other questions tagged rom-flashing custom-roms or ask your own question. how to install stock rom from recovery? Does Odin wipe system image when flashing a new Rom? Xperia Ray ST18i - CWM - install zip from sdcard, error message: This package is for “ST18i,…” devices; this is a “”. ?